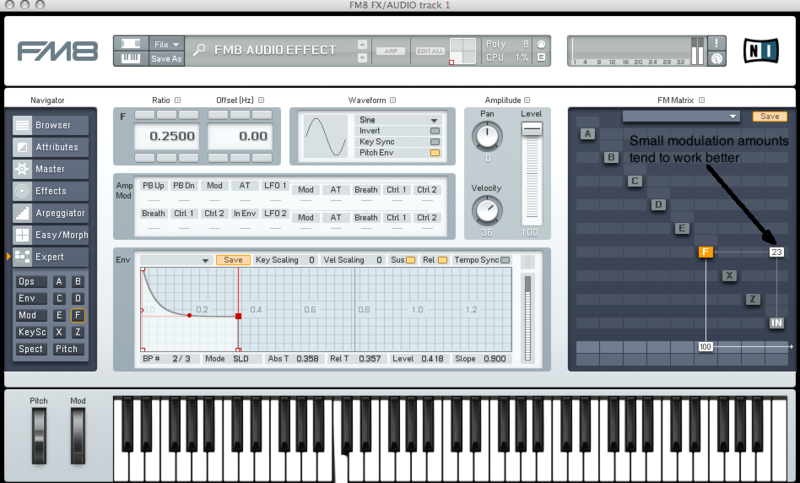 In this tutorial we will look into how to use FM8 as an audio gate effect. Audio gate effects are great creative tool used in many genres of electronic music and FM8 has a few great tricks which are not offered by other standard gate effect plug-ins. There are few different ways in which FM8 can work as a gate effect. Now, first let’s look at a standard filter based audio effect gate. Load FM8 audio effect version on your DAW’s audio track. I recommend you choose a simple saw wave as your audio sample for the purposes of this tutorial so you will be able to hear the gating effect on your sound more clearly. 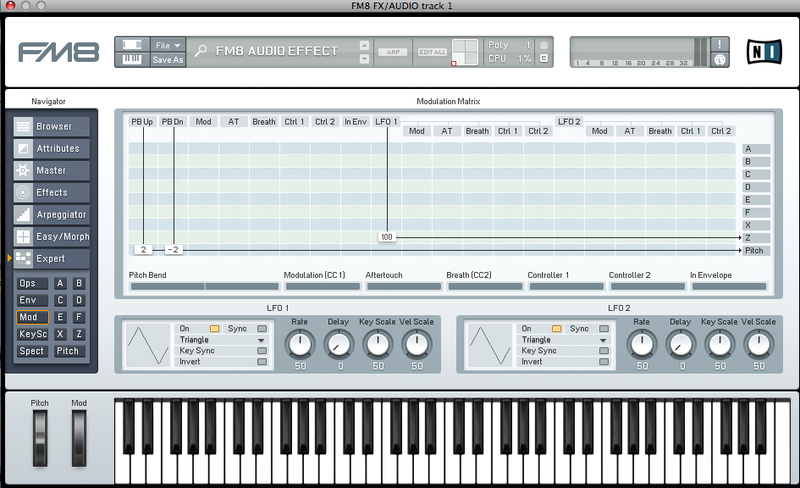 Now, create midi track in your DAW and route it to FM8 audio effect unit. Notes on this empty midi track will be used to trigger envelopes inside the FM8 effect unit. Go into FM8 operator matrix. There you see operator F routed to audio out. 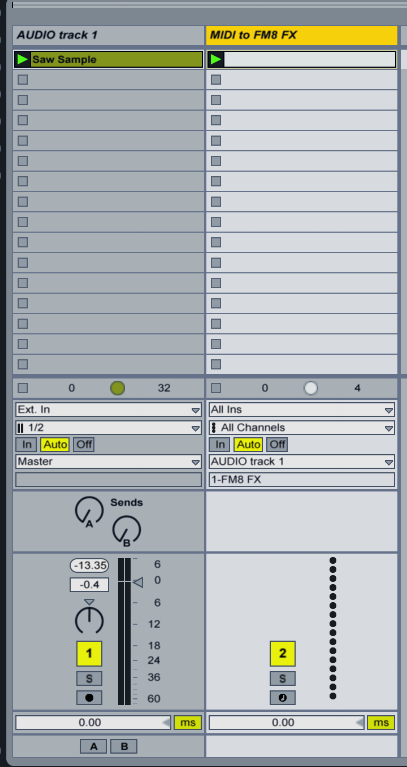 Disable it and turn off operator F.
The IN module in the operator matrix is where audio is fed into FM8 effect unit. Enable it by clicking on it. Now we have audio in FM8 and we can route it to the any of the FM8 operators. Now set the filter to a low-pass mode and chose only filter 1 for now. Draw a few notes of a different lengths into your empty midi track you have created before. These notes are triggering the filter envelope. But for now you don’t hear any sound because the filter envelope amount is set to zero. Raise it and you will hear the sound triggered by notes on your midi track. If you raise the sustain portion of your filter envelope the audio slice you hear will correspond also to the length of your notes played. And the great thing is that you can also use velocity information of your notes for filter envelope amplitude by raising the velocity control of the filter envelope. But wait, we are not over yet. The best thing is you can also morph in real time trough various filter configurations, envelope amounts, velocity amounts, panning settings which makes FM8 effect a really powerful tool for creative sound design. Go to the morph section of the FM8. Normalize timbres and the set different configurations for each of the FM8 morph square corner. You see where I am going? You can get some great filter morphing effects. Now we will use X sound shaping module as an audio gate. Disable filter module for now and route IN module trough X module instead. Here you have a whole new world of sonic possibility. Still we are triggering the X module envelope with our midi notes but the effect is quite different. We can distort, inject noise and crush our sound. Of course we can add also velocity control and morph all the settings in the same fashion we did above. Now the last option is to route our audio in into the any of the FM8 operators. By doing this we will modulate the frequency of the chosen operator with our external audio signal. Now the effect we get is highly dependable on the complexity of the sound we are feeding into FM8 effect unit and the most importantly the amount with which we are modulation the operator, its waveform and ratio settings. With modulation values under the 40 we are getting the effect similar to ring modulation and this is the most useful range for modulating the operator with external signal. At higher values we get into more extreme distorted territory. Again, you can apply velocity information to triggered operator envelopes, we can modulate operators between them self or feed the external signal to more than one operator but with different modulation amounts or maybe with different operator waveforms and ratios. And of course don’t forget you can morph between all this configurations. Another fun thing to do is to use LFO (or any other available modulation source) to modulate filter cutoff on FM8 Z module, or maybe distortion amount on X module or on any other operator. Just go to the mod section of the FM8 and apply desired amount to the module you want to use. If you maybe prefer envelopes triggered by FM8 internal arpeggiator then I have another tip for you. 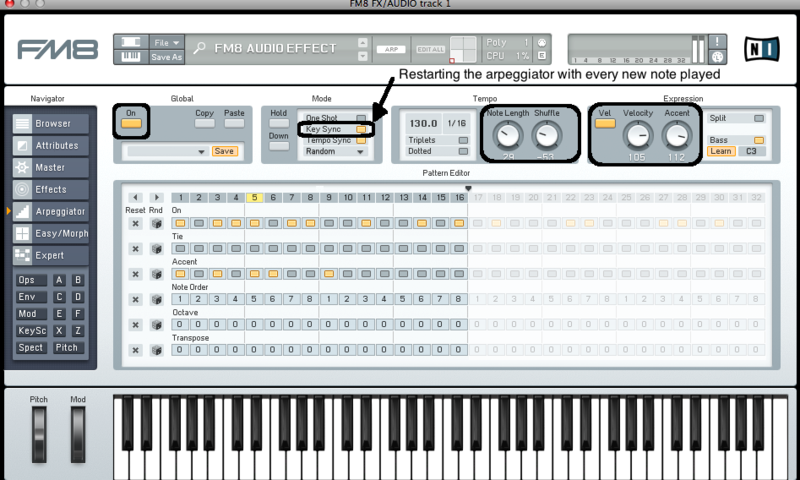 Go to the arpeggiator section of the FM8, enable it with turning the global On button. Draw one long note of 1 bar or so in your DAW midi track. This offers you a few very cool possibilities. You can choose the length of a triggered notes on the fly via arpeggiator note length control, you can apply velocity information and very useful accent and shuffle functions. And another trick is to enable the key sync button in arpeggiator. 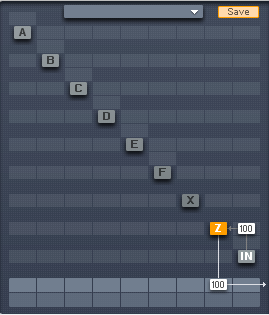 Now you can re-trigger arpeggiator with every new note played. As long there is midi note played, arpeggiator will keep running, if there is no note played it will go silent and for every new note it will restart itself. This way you can make some really cool gating effects. Also don’t forget you have also pre-programmed arpeggiator patterns at you disposal. 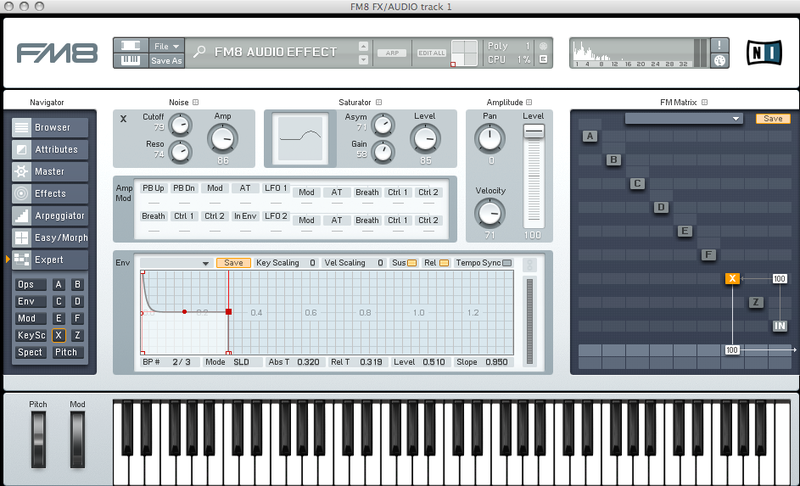 So, experiment a bit and you will see all the great possibilities which are offered by using FM8 as effect processor. You can morph between configurations of a single module or you can make giant effect patches where with each corner representing different effects path, one using X module, the other Z module, third any of the operator modules and the fourth combination of all three. 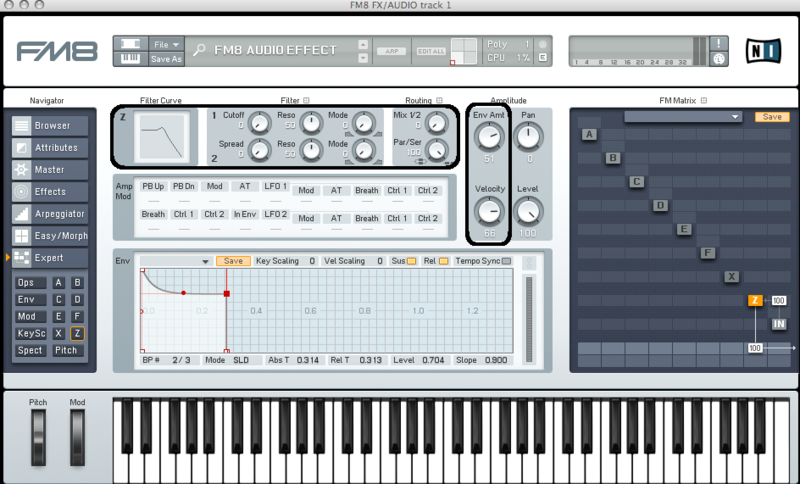 Also be sure to use FM8 effect section to further spice your gating effects.